I’m fortunate enough that I can almost anything I want, but others have restrictions on what they can eat. The Cape, the better half of the The Squinting Brummie, is gluten intolerant for example. 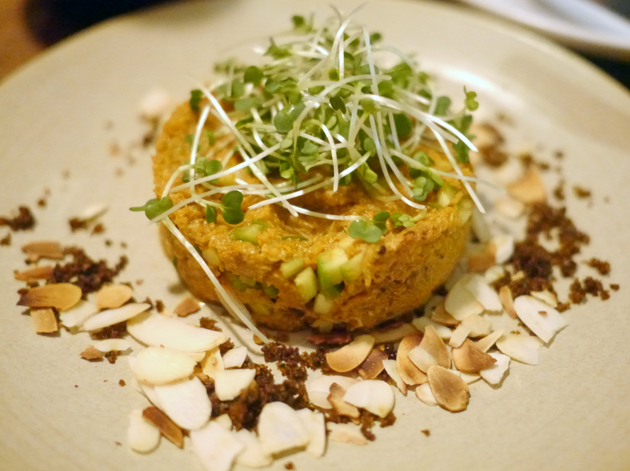 A surprising number of London’s restaurants do little to accommodate those with celiac diseases, but Imli Street, an Indian restaurant formerly known as Imli, does a far better job. 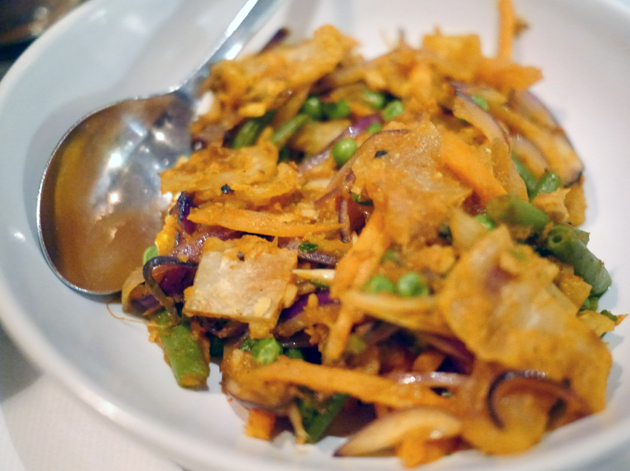 Although a good chunk of Indian cuisine is gluten-free anyway, Imli Street still has a guide showing which of its numerous dishes are suitable for those with various dietary restrictions, not just gluten intolerance. Although undeniably useful, its plain spreadsheet-style presentation needs work. In any case The Cape had no trouble parsing it for edible dishes. Doesn’t look as good as my dungeon. 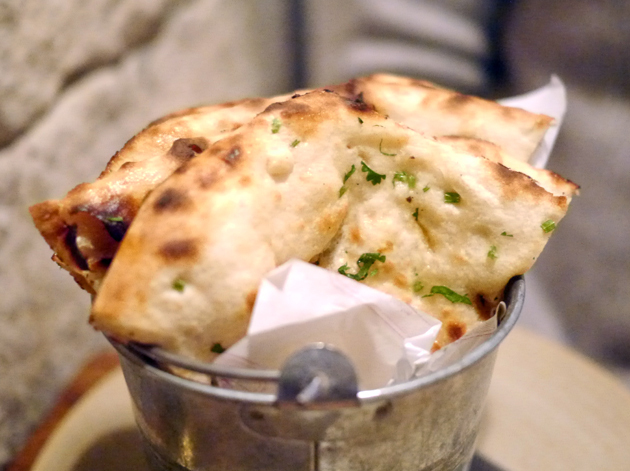 A bucket of naan bread – definitely not gluten free. Imli is different from other Indian restaurants. Its menu concentrates on small plates of both classic dishes and more inventive fare, while the stripped back interior is moodily lit. Mondeo Man finds the entire experience ‘poncey’, but then he finds anything beyond meat and two veg ‘posh’ so his petite bourgeois opinion counts for little here. In any case it’s all very different from its initial incarnation which had brightly coloured walls and even brighter lighting. As a visiting Yank wanting to experience traditional English delicacies, The Cape opted for Imli’s version of chicken tikka masala. 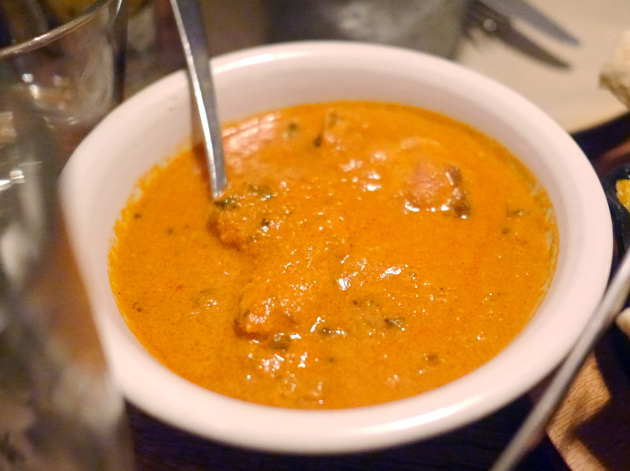 The Anglo-Indian classic tasted pretty much as you would expect – creamy, mild and inoffensive. Although The Squinting Brummie was pleased with both the sauce and the tender chunks of poultry, The Cape seemed a little disappointed from both its unremarkable flavour and the slightly gristly chunks of dark meat. The Cape wanted to complete her London experience by seeing some drunk Londoners throw up on the Tube. Tourists, eh? Both The Cape and I were unimpressed by the crab dusted with a hint of spice and accompanied by a scattering of almonds. The bitty head meat had hardly any taste or texture to it. I don’t like the look of your crabs. 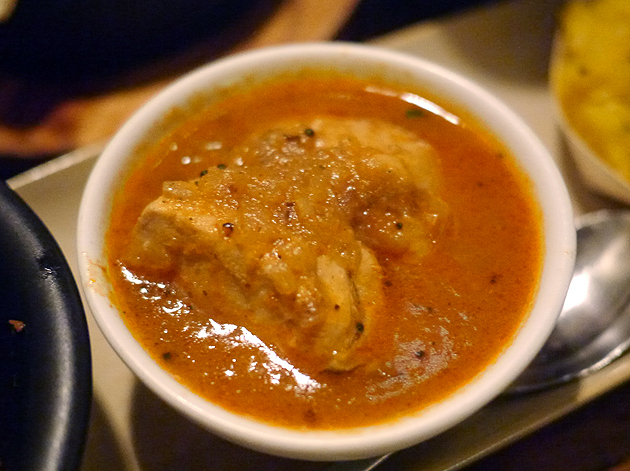 I was pleased by the fruity sauce and the light, yet meaty salmon-esque chunks of fish in the kingfish curry. A side of baby aubergine curry was disappointing though. While the aubergines themselves were soft and fleshy, the sauce they were served in was bland. The king of fish curries? I couldn’t convince either The Cape or The Squinting Brummie to help me demolish the chicken livers, although to be fair they weren’t missing much. Although offally and coarse, they were also quite dry and tasted much like pork kidneys. The Cape may be gluten-intolerant, but The Squinting Brummie clearly doesn’t believe in sympathy-ordering. He opted for the bizarre naan pie. 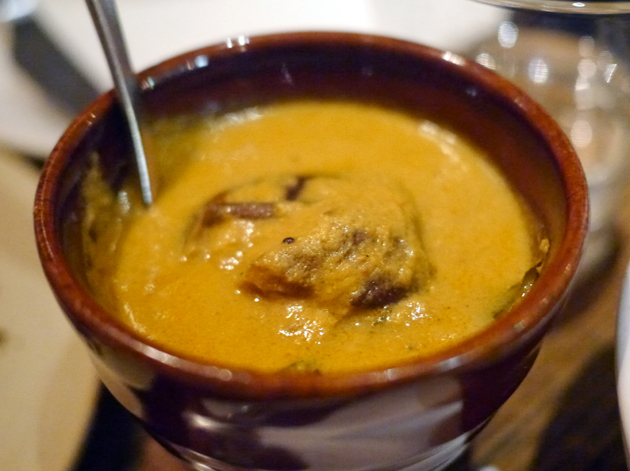 A rogan josh-esque layer of lamb curry was topped with both creamy cheese and mashed potato. To cap it all, strips of naan bread were planked on top forming a ‘pie crust’. It’s somewhat like a shepherd’s pie crossed with a lasagna, but the Brummie wasn’t fond of it. He found that the cheese tended to obscure both the taste and the fluffy texture of the potato. It didn’t compliment the mildly spicy lamb very well either. Like I said, bizarre. Pie in the Brummie’s face. A dish that I didn’t have much hope for, but which turned out to be surprisingly decent was the kothu. Thin slices of paratha bread stir fried with various vegetables and a hint of coconut proved to be a soft, addictive delight. 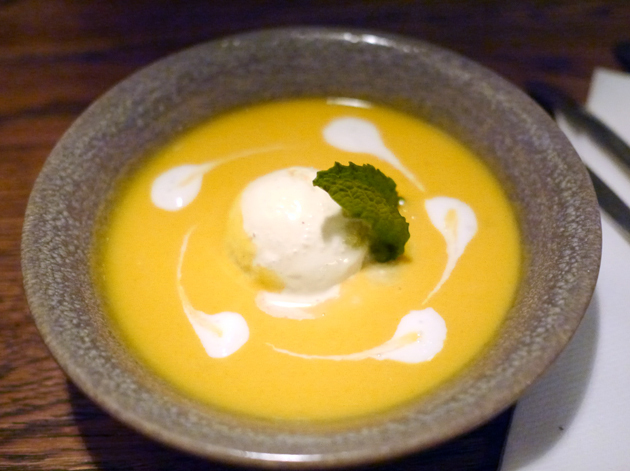 The only one of Imli Street’s desserts that’s apparent suitable for celiacs is the mango soup. If this sounds weird, then think of it as a thin mango milkshake – a milkshake served with a hint of basil and a dollop of coconut ice cream. The mildly thick and distinctly flavoured soup went down a treat, especially when paired with the smooth, moderately creamy and mildly flavoured ice cream. Or think of it as a mango sauce. If that helps you. Despite our national obsession with Indian food, traditional Indian desserts remain largely unknown by many and that’s a real shame. 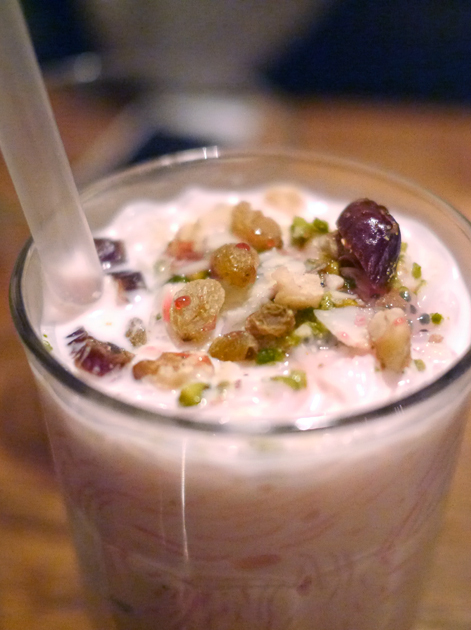 A few traditional Indian desserts are available here, such as the falooda. Sucking vermicelli rice noodles through a straw is an undoubtedly odd experience, but it’s a pleasurable one with a strong taste of rosewater complimented nicely by the dollop of sweet, milky ice cream and a dusting of crunchy pistachios. Slurping noodles with a straw. I visited Imli Street for a second time, this time without any of my dining companions. 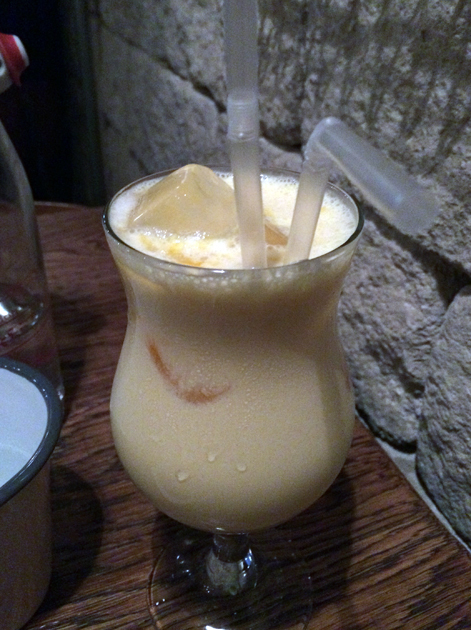 The selection of non-alcoholic drinks includes a mango lassi that’s suitably fruity and milky without being too overpowering or viscous. The selection of iced teas is odd though – the ‘lemongrass’ ice tea tastes mostly of pomegranate and lemon, with barely any taste of tea at all. 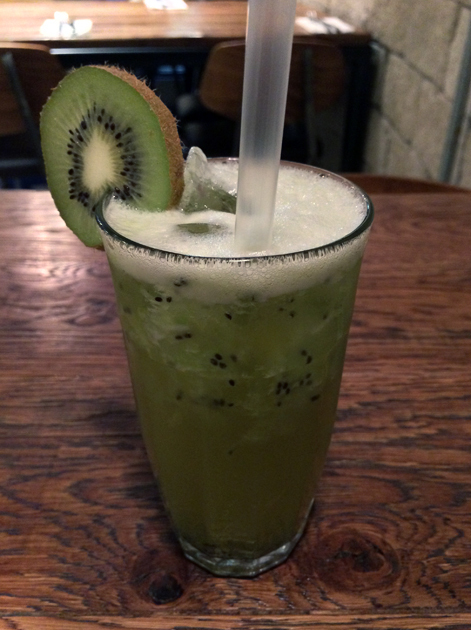 There’s a suitably stronger hint of jasmine tea in the Jasmine iced tea, but the dominant taste here was of kiwi fruit. A jug-sized serving would be preferable. 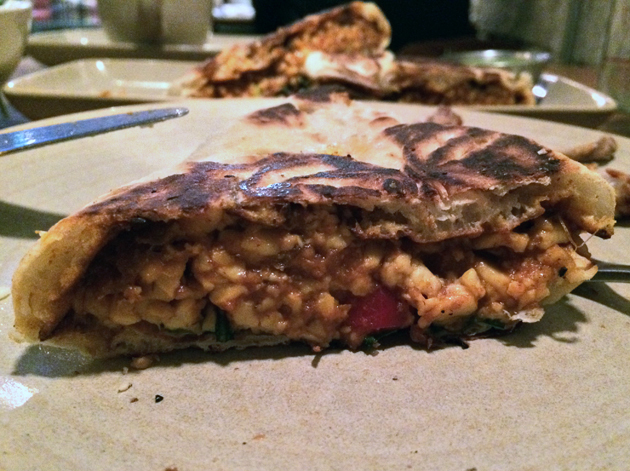 Following on from the naan pie, the naanwich is clearly evidence that the kitchen likes experimenting with odd naan-based dishes. Triangular wedges of naan are available filled with either butter chicken or ‘scrambled’ paneer and I opted for the latter. The bitty, bland mixture of paneer, rocket and peppers was disappointing with most of the taste coming instead from the mint dipping raita served in a small pot on the side. Up next, the Sunday naanroast or some other nonsense. It’s almost as if they’re coming up with the pun-filled names first, the actual recipe second. Broth and CTC is an odd-name for a dish. Toast soldiers topped with a mildly spicy layer of melted cheese was basic but pleasing. Dipping the soldiers into the thin, moreish tomato sauce obscured the creaminess of the cheese though. 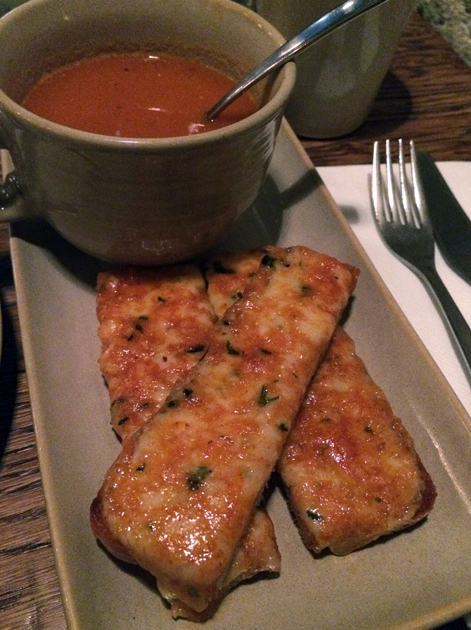 A misconceived dish and an overpriced one at £7. Another strangely-named dish was the Chicken 65, although this one was more successful. 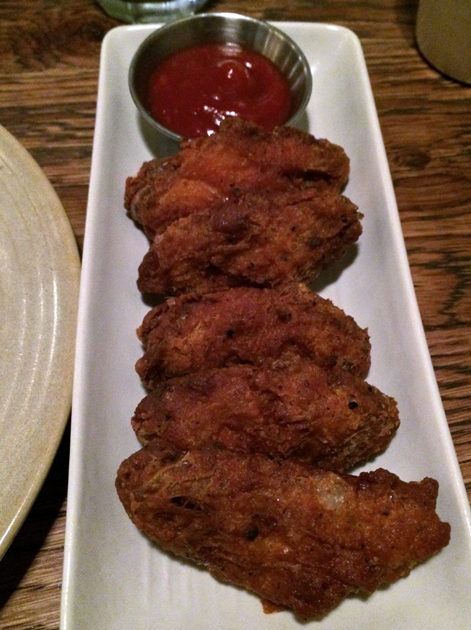 Crispy, oil-free fried chicken wings with a mild hint of garlic that was brought out by the fruity, garlicky ketchup served on the side. 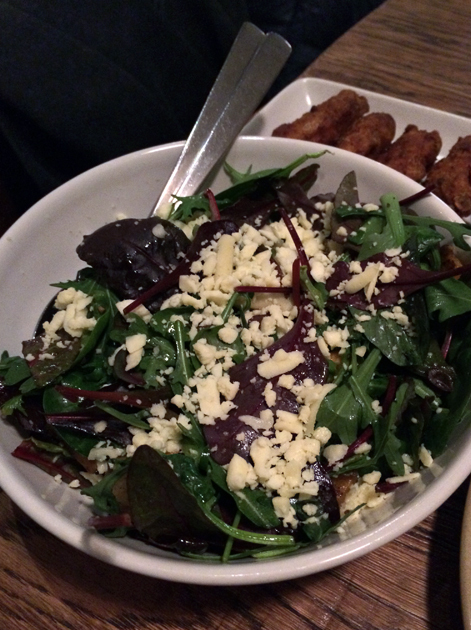 A dish that was generic enough to be served almost anywhere else was the roasted vegetable salad. The small slices of crisp pear, mildly sweet butternut squash and bell peppers, as well as a scattering of small paneer crumbs, were outnumbered by raddichio and other earthy leaves. Boring and generic? Oh goody. 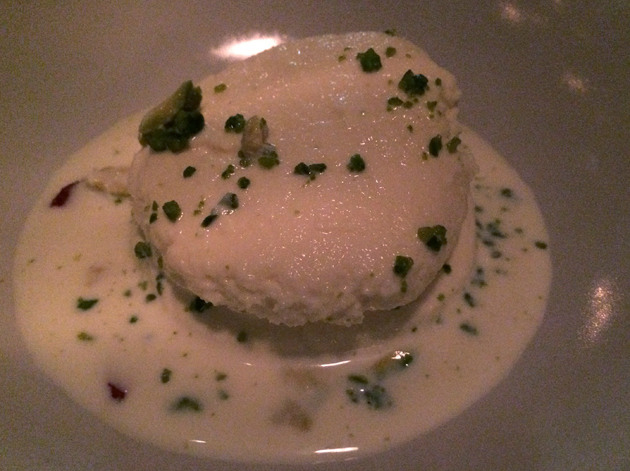 One of the other traditional Indian desserts available at Imli Street is the rasmalai. 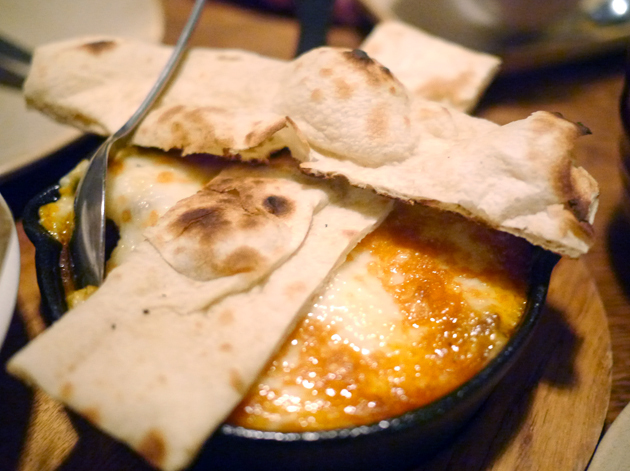 The bready texture of this poached paneer served cold won’t suit everyone, but I found it moderately pleasing. The lack of richness was disappointing, but the cardamom, pistachio and strawberry flavours of the milk puddle in which the paneer was served made up for this, as did the clean aftertaste. Dessert cheese, but not as you know it. There was nothing to make up for the weak, watered down taste of the masala chai though, unless you count sugar and milk. Sorry folks, no photo of this one. 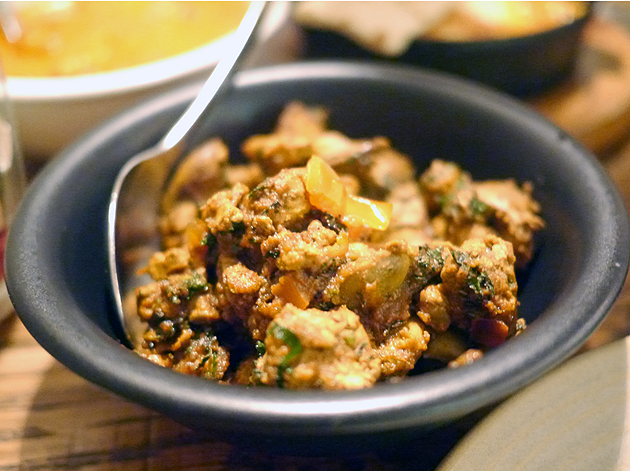 Attempting to preserve the convivial aspect of Indian food, while pushing forwards with inventive dishes that go beyond just curry is an admirable goal. However, the food at Imli Street falls short. Although there are a handful of quality dishes, most are either mediocre or just plain shoddy which just isn’t acceptable at this price. Imli Street may have a central location, moody lighting and take reservations, but these are the only advantages it has over its more traditional, but far better value kin out in Whitechapel. Opening Hours: Monday-Friday 08.00-23.00, Saturday 09.00-23.00 and Sunday 09.00-22.00. Average cost for one person including soft drinks and tea: £35-50 approx. Tags: aubergine, cheese, chicken, crab, curry, eggplant, falooda, iced tea, imli street, lassi, liver, london, mango, naan, restaurant, review, salad. Bookmark the permalink. 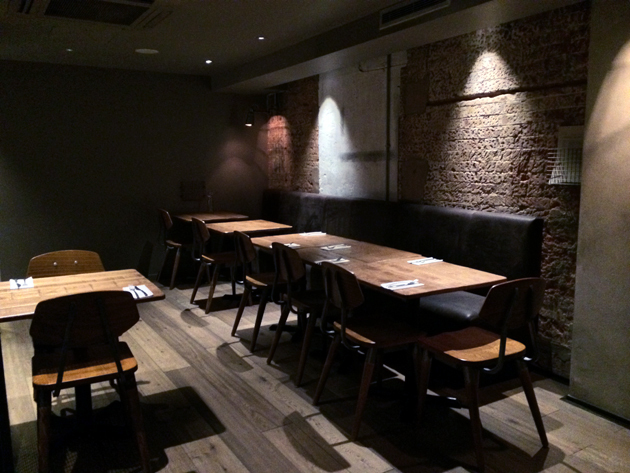 Previous post ← House of Ho review – modern Vietnamese food shakes up Soho?